This has been a truly memorable year for Sister Monica Byrne CP. In the summer, at a concelebrated Mass in the School Hall at Mount St Joseph’s school in Farnworth, followed by a party, and attended by 150 relatives, friends, colleagues and former pupils, she celebrated her 90th Birthday and the 70th Anniversary of her First Profession as a religious Sister of the Congregation of the Cross and Passion. 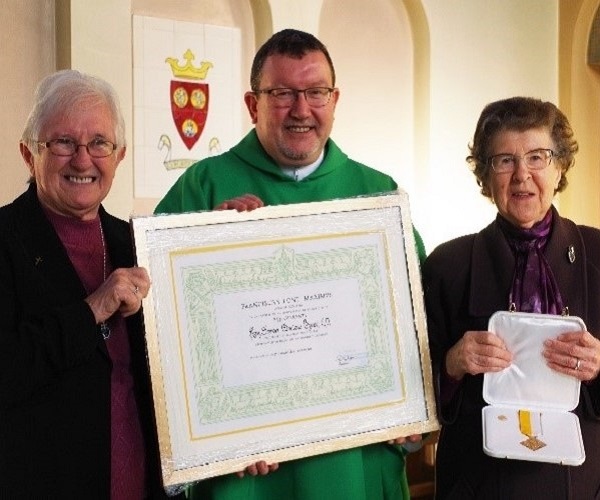 And at the end of last month after Mass in Saint Ethelbert’s Church in Bolton, she was presented with the Bene Merenti Medal, awarded to her by Pope Francis for her many years of faithful service to the Catholic Church and the wider community. The Medal and citation were presented to her by Sister Therese O’Regan CP, Provincial Leadership Team Leader of the Cross and Passion Sisters, in the presence of Father Morrough O’Brien PP and parishioners. In making the presentation, Sister Therese recalled Sister Monica’s lifetime’s work as a teacher and later as a Community Volunteer. There was, she said, something very special about Sister Monica as she recalled how she has now completed almost 64 years of unbroken service to Bolton’s Catholic community and to the wider Bolton Family and how for over 30 of those years she has officially been retired! Sister Monica worked as a teacher for 33 years, retiring in 1987. Since her retirement she has taken up many roles in her parish and wider community. These have been varied roles including 8 years, as a member of the Chaplaincy Team at the Bolton Institute of Higher Education, as it was then called, and, for 5 years she was involved in the ‘Sure Start’ scheme where she delivered video-based Parenting Courses. In addition to this Sister Monica also served as the Catholic representative on the Chaplaincy Team at the Bolton Hospice for 10 years. Along with her colleague, Sister Barbara Sexton CP, she has helped befriend and support Bolton’s asylum-seekers and refugees and, for many years, she has also helped Young Offenders and their families with home and prison visits, letter-writing, phone calls and texts. Sister Monica is a passionate supporter of the Ecumenical Movement. Not surprisingly, therefore, she has worked with ‘Churches Together in Bolton’ and has also served on the Bolton Council of Churches. Later this month, Sister Monica will finally be leaving Bolton to take up residence in her Order’s Retirement Home in Lytham. She will, indeed, be a great loss not only to Bolton’s Catholic community but also to the wider Bolton Family whom she has so faithfully and assiduously served in so many capacities. We wish her a long and happy retirement.